The February meeting of the Greater Williamston Business Association (GWBA) will be held Tuesday Feb. 21st at Fiesta. They will make plans for the Easter Egg Hunt which will be held on March 31. All area business representatives are invited to attend. The Greater Williamston Business Association is comprised of local businesses who have joined together to promote the greater Williamston area. 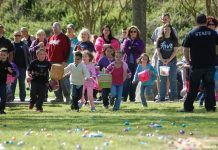 They sponsor or co-sponsor an annual Annual Easter Egg Hunt, July 4th event, GWBA golf tournament, Boo in the Park and participate in the annual Christmas Park.